Hey guys. I'm arriving in leicester train station around 9.25 on the Saturday so if anyone else is arriving at Leicester around that time let us know and we can all journey down to meet Aaron & co.
Is there a schedule that covers where the events are that don't come on at certain times? I.e The Harry Harris Alien collection. The same goes for anything else, that isn't a panel, like the UKCM and RPF prop displays for example. Will there be a form or something telling us were all these things are? Or is the Space Centre a simple place to get around. The Space Centre is pretty easy to get around and there will be plenty of marines around you can ask but there will be something to tell you what's on and where with a map included. With the show fast approaching we thought it would be a good idea to ask people what sort of things they would like to hear about at the various talks that will be going on. For the FX panel I'd love to hear what their thoughts on the evolution of FX are. Obviously some of them did physical models but that's moved towards CGI now. What are their thoughts? And for Charlie I'd like to know what kind of features we'll be looking at for Prometheus. Are we talking as exhaustive a set as the Alien Anthology? One week guys! I hope you're all sorted to get down there and stay! 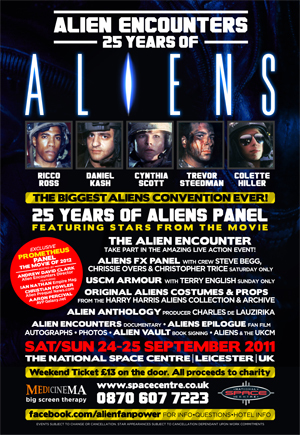 Britain&#8217;s largest Aliens convention kicks off this Saturday at the Space Centre in Leicester. As you can see there&#8217;s plenty to do over the weekend. Quite a few of our forum members are going and I&#8217;ll be speaking during the Prometheus panel as well. Make sure you get down there and enjoy yourselves. At least I'll be able to see Aliens Epilogue. I'm up and getting ready. Just a reminder, I'll be waiting outside in an AvPG hoody for Neil (gettodachopper) and Johnny (Johnny Gore on XBL). Anyone who wants to meet up, send me a message soonish before I set off. Should be getting ready to go as well but unfortunately have been struck down by food poisoning and feel like crap. That'll teach me to eat things involving chicken that I haven't cooked myself.